unlike false eyelashes, which are applied to the eyelid with a thick adhesive, and still appear ‘fake’. With semi-permanent eyelash extensions, your lashes are made thicker and longer through professional application of a synthetic eyelash that is curved to replicate a natural lash. Extensions are applied one lash at a time with care and precision using special bonding agents for a completely natural look! The result is thicker, longer eyelashes that are safe in the shower, while swimming, sleeping or exercising. Many of my clients are busy professionals and moms. What a great time saver! The convenience of lash extensions is incredible. Plus, the one hour monthly appointment for maintenance is a relaxing de-stresser. Me Time! The trend of the past has been manicures, acrylic nails, gels and now Shellac. While having nice hands and nails is great, others are looking at your EYES. Do you look tired without even a little mascara? With Lash Extensions, you don’t have to think about it. You have an eye-opening wow every morning! Lash Extensions have many options – from a long DIVA look to a soft NATURAL look. For proms and weddings, go for the diva! False eyelashes look fake, are hard to apply and may disastrously fall off at the most inopportune moment! Have fantastic pictures to last a lifetime: The Prom Night and Graduation, or The Wedding and Honeymoon. Lash Extensions will carry your through your special events. suiting your facial features and lifestyle. Your technician should have an artistic flair when applying your lashes. The right combination of length, thickness and curl is needed to achieve your custom look. While a full set is coveted for proms and weddings, a demi-set is great for everyday. Perhaps you want your teen to just have a little flair, but not over the top. Try an affordable Wink Set. Your lash technician should be able to customize a look just for you. the worst time for smudgy mascara. With one hour Refining Applications, you can have lashes indefinitely. Because the synthetic lash is attached to your own lash – without touching the skin or affecting the hair follicle – there is no interruption or damage to your natural lash growth. Your natural lash turns over every 60 to 90 days and a new extension is applied to keep your lavish look fresh. These one hour Refining Applications are recommended every 2 to 4 weeks. Whether you want lashes for a special occasion or for an every-day look to restore lashes of your youth, Lasting Looks has the professional, perfected technique, applied by a licensed, certified and experienced Eyelash Extension Specialist. Safe and affordable, trust your eyes to Lasting Looks! In 2006, after a 20 year corporate career, Melisa Ferriola opened Lasting Looks – a permanent cosmetics studio, lash bar and day spa now located in Hockessin, Delaware. The Lasting Looks mission starts with the desire to empower women to take charge of their appearance and to put their best image forward. Melisa lends her talent in skin care and makeup artistry to bring out the very best in her clients. As owner and operator, Melisa ensures that every client receives private, exclusive care. Her artistic skills and attention to detail show through in every service she provides. Melisa is a licensed Aesthetician and Certified Permanent Cosmetic Artist. 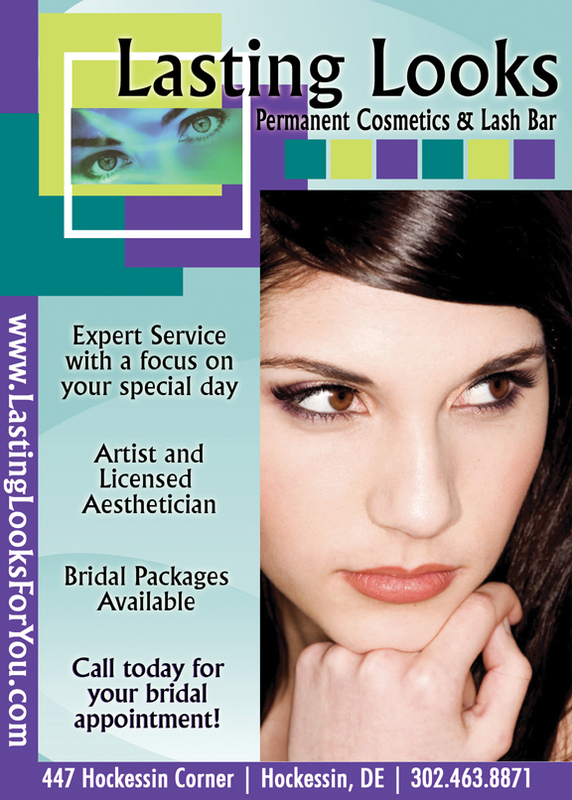 Lasting Looks is located in Hockessin Corner. Melisa resides in Newark, DE with her husband and children. She enjoys Piedmont Baseball and Softball, Girl Scouting with her daughter and a really good book.